We have a wonderful group of speakers and guests sharing with us this year at TypeParis. We wanted to find out a little more about each of them, so came up with a series of questions which they have generously taken the time to answer. Meanwhile, you should register to her talk on Wednesday 13 July 2016 in Paris. 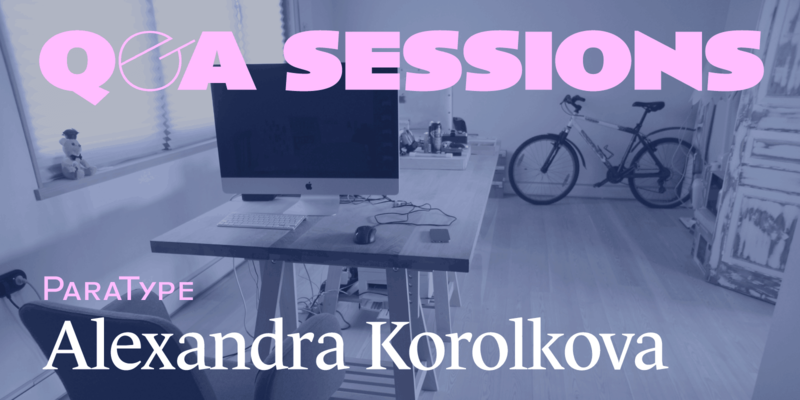 This week we chatted to Alexandra Korolkova. Alexandra is a Russian type designer, book designer, typographer, typography & font theorist, and a teacher. She is the author of the textbook Typography Live, and has won the ATypIPrix Charles Peignot award. PT Sans & PT Serif compared. Download the fonts for free at ParaType. Alexandra Korolkova: Let me answer about type design: I like that it is sort of a synthesis of exact science, humanities and art. And I really love solving creative problems — which is a very important part of type design and typography. In fact, when graduating from secondary school, I was looking for an art school that would be closer to something more practical than pure art. I chose University of Printing Arts almost accidentally, not knowing what a graphic or type designer is, but I never regretted my choice because it seems to be exactly what I needed. I don’t like escapism that much. I just think it’s no reason to choose a point in history when you aren’t able to move into it. I like the last quarter of 19th century, late 1920s, 1960s but I think that these points had both their advantages and disadvantages. And also I think that everything can change radically in the near future and you can evaluate the historical period of someone’s life only when that life is over. Almost not: I prefer making rough sketches and writing detailed plans by hand and then go to my computer and follow the plan. The main differences are that several years ago I was always thinking with a pencil in my hand and now I try to keep in mind as much as possible and fix more precise thoughts. Alexandra Korolkova recommandations for Cyrillic ductus. I’m a boring person, I don’t read magazines and watch TV series. And I can’t choose my favourite movie (and I watch them quite rarely), I can just say that I prefer something life-asserting. Envy! When I was a student and I saw how much my professor knew and how interested he was in type design I decided to do my best to attract his attention. Perhaps I should tell about my participation in Public Types of Russian Federation project, or about the Prix Charles Peignot award… But what I subjectively consider my most satisfying achievement is that I see my fonts on billboards, in ads and signs not only in Moscow but in small towns and in non-professional typography. I always wanted to design something not just for enclave of professionals but for mass users, something that you can see sticked to every fence, so I’m really happy about it. As for now, it’s modern residential architecture and everything inside and around it. Perhaps that’s because I was deeply involved into design and building of the house where my family lives now. And I always loved children’s books and still like to read them (and sometimes design them… though it’s not outside the industry). I also like folk arts and exploring old not-crowded towns. — Interview by Dave Coleman.